Apple rival ups the stakes with supercharged Surface devices. 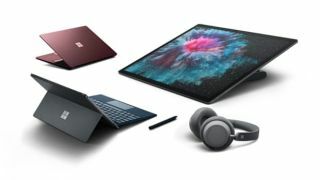 Microsoft has revealed a new supercharged Surface Pro 6 and Surface Laptop 2 as the battle to create the best devices continues. The company also unveiled a much-needed upgrade to its Surface Studio 2 desktop and new Surface headphones at its recent big product launch in New York. News of the Surface Book Pro 6 especially, will be welcomed by creatives on the hunt for a powerful and flexible alternative laptop to the MacBook Pro. As our Microsoft Surface Book 2 review revealed, these devices have been designed as do-anything machines with both ultimate versatility and swashbuckling power. Harnessing a new kind of power, the Surface Pro 6 and Surface Laptop 2 now come complete with Intel's 8th-generation Core processors to match competitors, such as Apple’s MacBook Pro, with a 67 and 85 per cent increase in speed respectively. Battery life is also on the up, with the Surface Laptop 2 now boasting 14.5 hours and the Surface Pro 6 maintaining a solid 13.5 hours on a single charge. Microsoft has focussed its efforts under the hood with the Surface Pro 6. Maintaining its part-tablet, part-laptop functionality, the new model, available in black and platinum, looks largely the same to the naked eye. The Surface Pro starts at £749, which makes it a great option to those creatives who need to compromise slightly on budget but not power. The Surface Laptop 2, however, has undergone a noticeable makeover, sporting a new touchscreen and thinner than ever LCD display. This is also the quietest model, with the keyboard covered in Microsoft's signature Alcantara fabric, and there's new new colour options too for the Surface Laptop 2, now available in black, burgundy, platinum and blue. Pricing for the Surface Laptop 2 starts at £949, with both models available to preorder now. Also among Microsoft's announcements was the exciting news of its Surface Studio 2, the first major update to its desktop PC, which we first saw back in 2016. Features of the Surface Studio 2 include 50 percent more graphics performance, a 28-inch display which is reportedly 38 percent brighter and has 22 percent more contrast than the original model. Microsoft have seemingly gone all out with this device, including a brand new Surface Pen with tilt function and Surface Dial controller with haptic feedback. The Surface Studio 2 is available for pre-order now, expected to ship 15 November, and priced at $3,499. Computers weren't the only hardware on the menu at Microsoft's product launch, with the unveiling of its Surface Headphones. Complete with noise cancellation, automatic pause and play and Microsoft's digital assistant Cortana, these wireless headphones not only offer excellent sound quality, they can also read you emails, or kick off your conference call. The Surface Headphones are expected to be released later this year, firstly in the US at $350, before heading across the pond to the UK in time for Christmas. To add to this extensive list of updates Microsoft also announced that the Windows 10 October update will arriving for users later this month.